Whilst planning the move, Geoff hasn’t been idle. Having had a career in the IT industry, his interests outside of work have always had a very practical nature: being adept at home DIY projects, taking on a number of bathroom and kitchen projects over the years, as well as the usual painting and papering. This, along with his photographer’s eye for composition, led him to start with the basic mounting and framing courses in February and March this year. 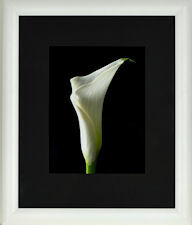 He has developed his skills through other framing and photography courses and by building up a stock of sample pictures. The net result is a very strong foundation in exactly the type of business he will be promoting more fully, once based in Devon. The original idea was to sell his own, fine art photographs: having investigated further, Geoff recognised how hard it is to turn a profit in this area, especially if part of that profit was being lost on a third party mounting and framing his work. The “practical person” kicked in: why not take over the final look of his work? Being on top of quality control, taking over the presentation and construction of framed work, really appeals to what he describes as a “workaholic perfectionist” personality. And that’s exactly what he has achieved. He currently works from his large, double garage. It’s OK for very low numbers of pictures, but can feel quite cramped, and doesn’t offer separate work areas for frame construction and mount cutting/assembly. Once in Devon the plan is to have a separate workroom, large enough for a more efficient and practical layout. Having said that, even then, the intention is not to gear up for high throughput, as Geoff is very keen to establish a business where quality is of greater interest than volume. 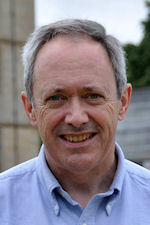 Geoff’s love of photography is the driving force for his business: producing complete pictures, either to a style that he has created, or customised to a customer’s requirements. 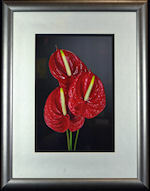 Hopefully as much as possible of his business will involve his own photographic work, but he is equally at home framing customer’s own artwork as well. 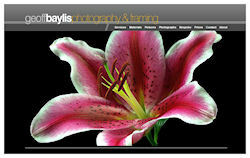 He recently launched a website (Geoff Baylis Photography & Framing)to showcase his work, but the initially plans to expand the business through exhibiting at craft shows and similar events. In fact the first one is being planned for November, although he remains a little nervous about whether the investment will bring in the business to make it worthwhile. With plenty of business cards and brochures available, even if people don’t buy there and then, they can take away contact details. There’s no doubt he has a good product to sell, at least equal or better than the competition often on show at these events: so why not take the plunge and see what happens? Preparations for this sort of event, with the current workshop (garage) restrictions, have required a real amount of practical organisation. Everything takes place on a workbench that’s about 2.0m x 0.8m. Geoff has built racking for mountboard, glass and moulding stock in order to keep everything clean and tidy: this is particularly important, as the same space doubles as his photographic studio. His main pieces of equipment are a Framers Edge 655 mount cutter, Logan Studio Joiner, Logan Pro-Saw and a Mitre Trimmer. He has developed framing expertise through trial and error – and lots of practice in between each course taken, all the time being ultra-critical of his own work and concentrating on improving his perceived areas of weakness. An additional bonus, as part of early-retirement planning, was being able to take some general courses about starting a business. This provided a real view of the basics of what to expect, along with lots of reference information and ideas of where to find more details. A final part of that preparation was by attending the DIY Framing course: Organising and Planning A Framing Business. Naturally, the very first piece of commercial framing always adds a little frisson of excitement. spend time online to understand everything that’s needed to set up a business – there’s lots of free information available on the HMRC website and elsewhere. don’t underestimate how much time it will take – and prepare a plan of action so that you don’t forget things. practice, practice, practice! Those first frames you produced and were so proud of will make you cringe a few months later as you realise how limited your skills really were then. start every new job with a new blade, especially if using textured mountboard. strive for perfection. I’ve still got a lot to learn, but I want everything I produce to be the absolute best I can make it and I’m always looking for ways to get better, more stunning, results. The David Wilkie Masterclasses give a humbling insight into what “best in breed” framing looks like. ... and remember if you are really dedicated to framing, it can absorb much more time than you ever expected! In particular, getting a website to look good and be well populated, even if (like Geoff) you are using a template provided by the website host.